Madison High School candidates Wynter Razzanoa, Cammy Nguyen, Ethel McBee, and Gabrielle “Gabby” Ferrogiaro take their places on stage. 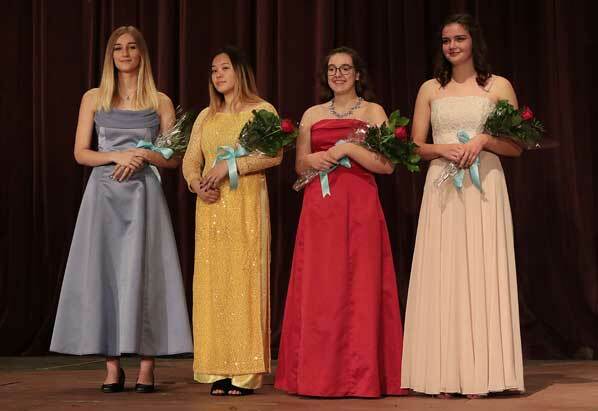 Excitement was in the air inside the Hibbard Theater at Madison High School on March 19, as the Court of four Portland Rose Festival candidates gathered for the big announcement. 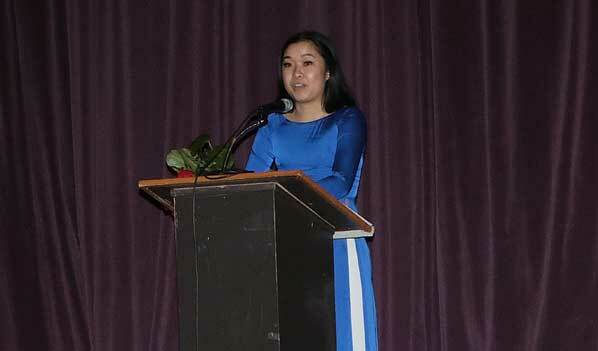 Before the program began, the 2018 Portland Rose Festival Madison High Princess, Stephanie Vo-Nguyen, told East Portland News that it’s been a great year for her. Greeting her fellow students for the last time in her role, is last year’s Portland Rose Festival Madison High Princess, Stephanie Vo-Nguyen. The program was brief and simple, beginning with the four candidates being escorted to the stage. Then came introductions of Portland Rose Festival Foundation dignities and staff, and the attending Royal Rosarian was announced. Giving a gift to each of the candidates is the Unitus Community Credit Union Mentor Megan Snyder. Unitus Community Credit Union Mentor Megan Snyder said she was delighted to meet the four well-qualified Court members. 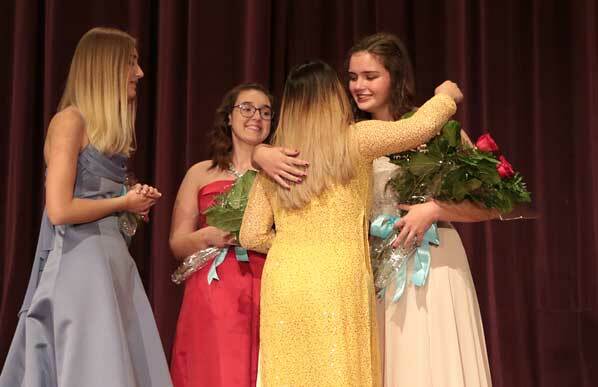 The outgoing James Madison High School Rose Festival Princess, Stephanie Vo-Nguyen, congratulated this year’s candidates, then opened the envelope and announced the 2019 school selection. 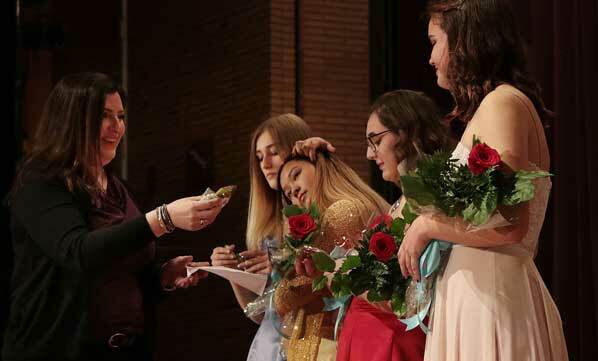 As her name is announced, Court members congratulate Gabby Ferrogiaro – their school’s representative to this year’s Portland Rose Festival. After the official photos, 2019 Portland Rose Festival Madison High Princess Gabby Ferrogiaro told East Portland News that she’d grown up in Northeast Portland, and was educated through eighth grade at Roseway Heights School, before her four years at Madison High. About the students, Princess Gabby remarked, “Everyone is so friendly and inviting. This year I joined Track; it was awesome how well I was accepted by the other team members. 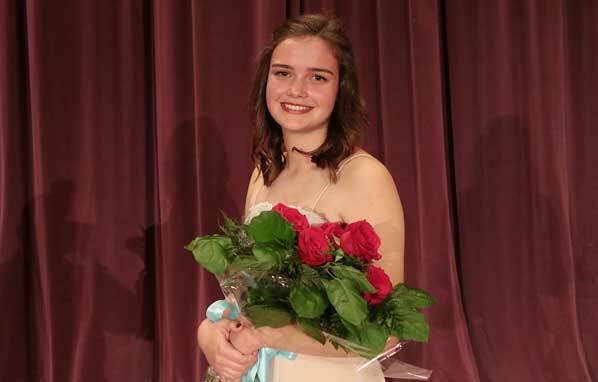 Congratulations to 2019 Portland Rose Festival Madison High Princess Gabby Ferrogiaro. With an eye to a career in visual arts, Princess Gabby plans to attend a four-year university and earn a BFA in Illustration. Her artistic aspirations will be supported by the $3,500 scholarship she will now receive from The Randall Group. Plan to cheer on Princess Gabby at the Portland Rose Festival Queen’s Coronation on Saturday, June 8, at 8:30 a.m. – just before the Grand Floral Parade – inside Veterans Memorial Coliseum. For tickets or information, see their website: CLICK HERE.